And I'll take 'em in a cast iron skillet any day! Yup. That method usually gives a nice texture on the outside too. 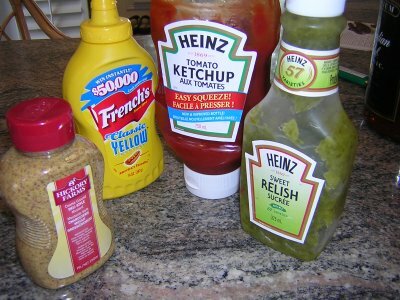 Okay, on the meatloaf front, here's the big debate... red sauce or brown? Gravy please. Everything can be made better with gravy. Even meatloaf. but then there's creole sauce. They serve meatloaf with Creole sauce at Threadgills, here is the link to their meatloaf and their creole sauce recipe. The creole sauce is how I make it, and the critical issue with this recipe is the file' powder. I honestly don't think I'd bother making it without it. The meatloaf is good on it's own though, and once I was out of bacon and used chopped up panchetta on top and man it went over the top. good stuff. 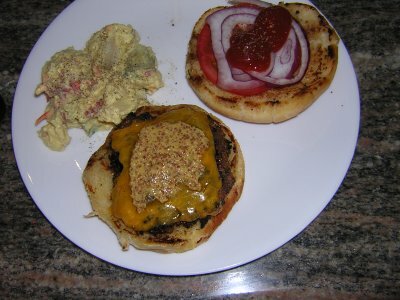 I made the best hamburgers ever last week, nothing but chuck steak sauce and s&p. I think the cooking technique is key to good burgers. 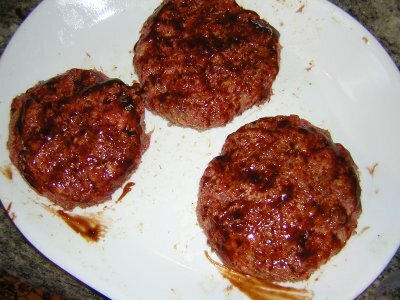 I don't care what you put in them for flavor..hell truffles couldn't save an overcooked hamburger. I think it would work great with buffalo, which is often too dry to make a really great burger. I am going to make hamburgers! I am also first the first time going to grind them myself, so my first couple questions are what kind of beef to use and what is the best way to grind them? I have both a food processor and a meat grinder. All right folks. Peanut Butter Burgers. God given juiciness! It was a lovely day to grill here. 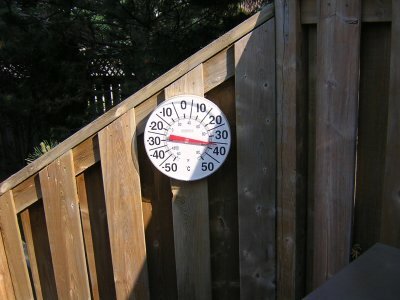 The temp in the backyard at 6:00 p.m. was still a little over 30C. Yes, I know it says 36C, but it was in the sun, so take off 5 or 6 degrees. First you gotta get all the ingredients in the bowl. 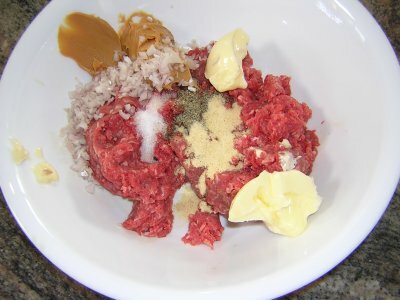 Salt, pepper, garlic powder, peanut butter, butter and some chopped shallots, ground sirloin or lean ground beef. Form into patties and chill those suckers for at least two hours. More is always better. Grill on med high heat. Turn after about 4 minutes. Note they are holding together nicely. I like my hamburg buns grilled, Ryan does not. There's no way I can get a picture to do justice to the juiciness of these babies. But then again, Ryan ate two, so they can't be all bad. Oh did I mention I actually grilled these my own self? I'm starting to scare me. What is this in real temperature? I know nothing of these numbers which you refer to. There should be an international standard that we can all use. 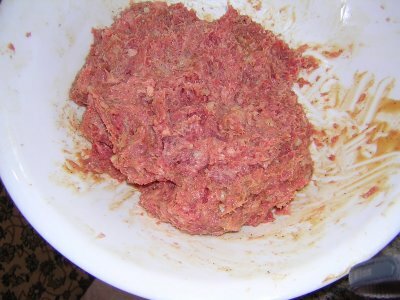 I am making some fabulous burgers, from beef, the way that God intended, for a suprise (don't tell her) party for the lovely Mrs. Mayhaw, which will be occuring Saturday night in my big wreck of a house. 60 people, with kids (you bring em, you watch em). It should be fun. I am thinking that since I have already lost my mind, I might grind several kinds of beef and see what the variations are like. No buns though. 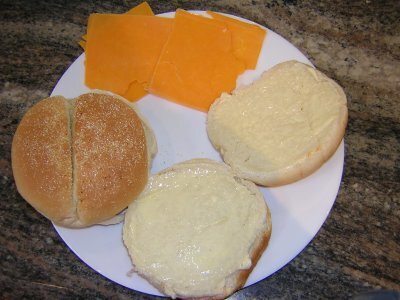 I have no oven to put a bun into to. Also, for your voyeuristic pleasure, I am going to make a meatloaf on the Weber. It's a pretty interesting process. You are absolutely right. There should be an international standard! When will the US be joining the rest of the world? Kristin, I was extremely happy with the chuck roast I got from Whole Paycheck last week. (I may be wrong, but I believe that the most recent recommendation for chuck that I've heard came from Alton Brown, who also said that ten pulses in the food processor ground the meat to the perfect texture.) I ground about 3 pounds with about 3/4 of a pound of fat for that 80/20 ratio, using my KitchenAid grinder, and added only some herbs and spices before forming the patties very gently. Which brings us to another major philosophical issue. I'm very big on the gentle patty molding; I can see that Marlene is at the other end of the flesh manipulation range. What say y'all? Do you tenderly tuck the meat together, or do you mash the meat mercilessly?? There's a reason for that Chris. With the Peanut burgers you have to mold them firmly because there isn't a lot of binding to hold them otherwise. Mold firmly and chill, otherwise, they fall apart. Makes sense. Still and all, I certainly know people who are firm about the need for a firm hand when making burgers. Of course, terrines are regularly ground fine and weighted. Just trying to find even more ways for people to disagree! 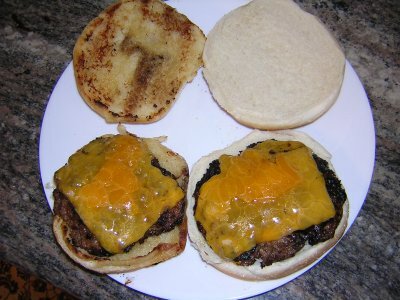 Ah, now when I make beer burgers, I don't mash them together so much. Kristin, I was extremely happy with the chuck roast I got from Whole Paycheck last week. You don't by chance know how to say chuck roast in Japanese....? I guess it is time to sit down and learn my cow parts, anyone know a good site? 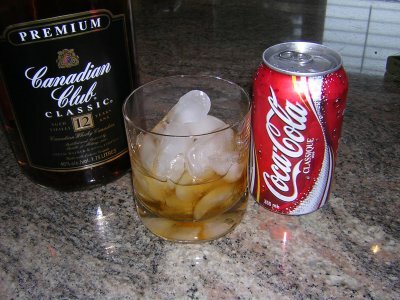 These sound good to me. turkey burgers with double smoked bacon. We dont eat red meat( but yes, we do eat bacon) so I think I'll go with those. I'll be using a mix of dark and white turkey. Check my blog for pictures of the turkey farm in my area. 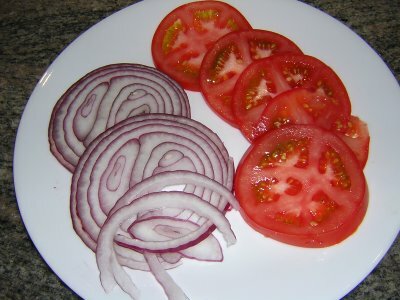 Type "beef cuts" into Google and you will get lots of sites. The chuck is the shoulder. There are quite a few sites with explanations of beef cuts but this one is pretty complete, with pictures of the cuts and explanations for each. Alas, I have no photos to prove it. However, I do have confirmation that room temperature ground beef is utterly entropic, collapsing shortly after being placed onto a hot grill into shapeless clods of meat. Those two sentences have a reverse causal relationship, btw. I don't think I've ever thought about this. I usually grill them right out of the fridge. 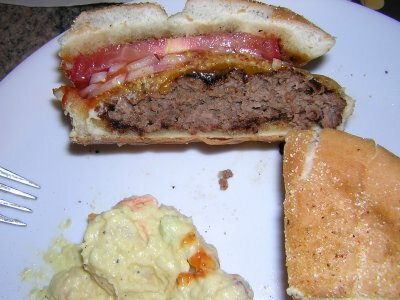 So, sounds like you have to grill burgers again fairly soon so you can post some photos! As soon as it quits raining, burgers are on our menu. I'm still pondering meat loaf and will probably be asking a mess of questions. Well chilled is a key to good grilled burgers. Room temp just doesn't work. Next time we want photos Chris. brother-in-law and sister-in-law coming down for dinner before the iron maiden concert. burgers, hot dogs, macaroni salad, german potato salad, saurerkraut with beer, etc. 80/20 beef, garlic powder, salt and white pepper, "cattleman's sauce". john enjoyed the burger which was medium. 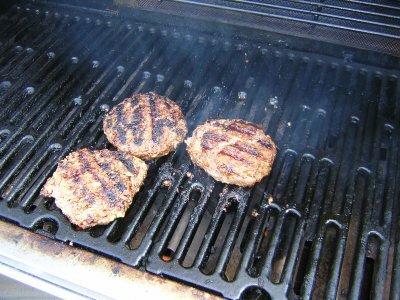 grilled but then had to "better cook"(cook to grey and brown) the burgers for the bil and sil. they don't eat any meat that is pink/red. 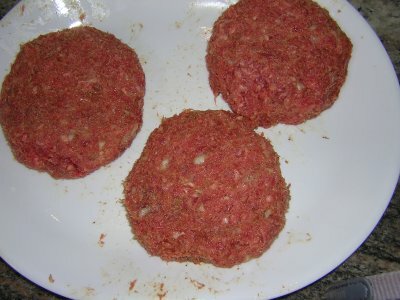 though i did find some ground lamb in the freezer so next weekend i think it will be modified suvir's lamb burgers with tsziki and pita... will have to see. I'm aghast: did no one make burgers this weekend?!? Basically, you are looking for a "kata roosu." But tonight might be the night for the meatloaf recipe I've been wanting to try for ages! I'm having one of my worst work-weeks ever (and it's only monday.. ) and I've decided that Marlene's peanutbutterburgers will be just the thing to cheer me up this evening. No burgers in the Jensen household...we grilled chicken skewers instead. I really want to try the meatloaf challenge but I'm waiting to see how others are cooking the meatloaf on the grill. There is no way I'm going to turn my oven on in June! Fall is but a whisper of the recent past--at least it is where I live in the upper reaches of Eastern, Washington. We had our first fluff of snow a week ago and a reasonable November storm is predicted for this weekend with temperatures holding at a chilly 18 degrees at night. Along with the rumblings of cold winter weather and Holiday feasts, we turn our culinary musings to time-treasured, comfortable dishes. And so I invite you to join me in another kitchen adventure--the inimitable eG Cook-Off Series. In 2013, we've tackled the tricky cooking of Squid, Calamari and Octopus and we made delicious dishes out of the humble Summer Squash. But today we're shunning all manner of counting calories, salt or fat content--for what is rich in flavor is good for the soul my dear friends. Please join me in crafting, nuturing and savoring a dish of Confit.